Taipei, Oct. 4 (CNA) More than 15,000 people laid down Saturday evening in front of The Palace, a luxury apartment complex on Renai Road in Taipei City, in protest against exorbitant housing prices. 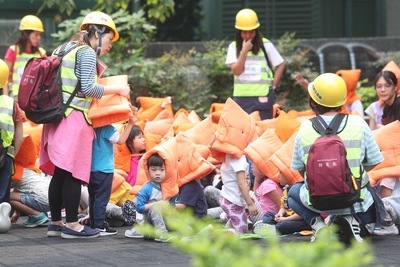 The people, answering the call of a group known as the Housing Movement, are staging a sleep-out near the city's most expensive property , which is valued at about NT$2 million (US$52,085) per square meter. The city's Daan Police Precinct urged the protesters to make their demands peacefully and rationally and maintain order at the site. The Housing Movement was scheduled to hold a press conference at 9 a.m. Sunday after the sleep-out to announce its follow-up activities. The protesters are demanding legal amendments to cover five areas of housing regulations. They are calling for housing rights to be incorporated into the Constitution and for forced evictions and demolitions to end; reform of the housing tax system to stem speculation; construction of more social housing for rental only, to make up 5 percent of the total homes in Taiwan; a halt to construction of for-sale public housing; and development of a housing rental market. In response to these demands, the Executive Yuan has announced government plans for an additional 34,000 public housing units over the next decade, according to local media reports. Meanwhile, the opposition Democratic Progressive Party (DPP) said Saturday that it has come up with a comprehensive housing policy and will collaborate with housing and residential scholars and experts to achieve housing justice by amending laws and promoting tax reforms. DPP Chairwoman Tsai Ing-wen said on her Facebook page that residential policy is important and the government has a responsibility to ensure people's right to adequate housing. She said the DPP held a public forum on the future of young people, during which some conclusions were reached, including plans to increase low-cost social housing, formulate a special residential tenancy law to facilitate legalization of the rental housing market, and promote property tax reforms. Meanwhile, former DPP Chairman Su Tseng-chang said the government plays an important role in the development of a sound housing market and should introduce real estate tax reforms to curb speculation in the property market and ensure reasonable housing prices.